eirebilly wrote: It will be tight Neily but Ireland are in that habit of winning, especially at home. Ireland biggest concern is their defence, if Scotland get a large amount of possession then they certainly can cause Ireland some problems. So if Ireland give Scotland as much possession as they (Ireland) gave France? I think I want to say home advantage will see Ireland over the line. But then I think we must have learned something from the debacle that was Cardiff. Then I think, don't get too optimistic...that only guarantees a thrashing. Fecc me but I hate game week in the Six Nations. France are not as potent in attack as Scotland I feel. Wales scored 27 points with only 30% possession against Ireland in Dublin. Ireland have a very narrow defensive line for me which is something Scotland can exploit. As I said, if this was in Scotland I would have Scotland as slight favourites. I think if this 6N has taught us anything it is that predicting what will happen with Scotland is very difficult to do! Ireland will be hot favourites to win but that doesn't mean we can't. I'm actually predicting Ireland to come all out attack to start with - they showed signs of doing that at the beginning of the Wales game but reverted back to their traditional plan at times. I have a feeling Ireland are going to look to surprise us. I wish I was in Dublin for this. It's not that it's completely irrelevant who wins. It's just that you have exactly the same night out in town regardless of what the result was. It could all come down to breakdown interpretation. Who's the ref? Poite style ref compared to Barnes type ref would be the extremes. Hopefully nigel is incharge he likes a fast pace and doesn't miss a thing whilst being sympathetic with the game. England fan BTW with no whinges. Looking forward to this clash! Yoda wrote: It could all come down to breakdown interpretation. Who's the ref? Poite style ref compared to Barnes type ref would be the extremes. Hopefully nigel is incharge he likes a fast pace and doesn't miss a thing whilst being sympathetic with the game. England fan BTW with no whinges. Looking forward to this clash! Interesting read that and I do agree somewhat about Ireland committing men to the breakdown opening space out wide but I also felt that Jackson favoured Ireland at the breakdown and as a result Ireland were able to secure more ball. I am not sure that Barnes will be so lenient on Ireland at the breakdown. I still think that Ireland defend way too narrow and that could be exposed by Scotland. Ireland do evidentially defend too narrow. Ireland do emphasise breakdown (using up players for bang, bang and leaving areas out wide very exposed). Ireland have their gameplan - and like other Nations' gameplans - there are relative weaknesses. Opponent coaches look for the weaknesses and try to exploit them. But it's about percentages. What do you emphasise? What do you compromise on? What is the end result? How often do you succeed with the gameplan you choose? Do your pointed weaknesses sacrifice too many games or are they negated in a sense by the aspects you concentrate on? Ireland have their gaping hole that all good coaches obviously see and are on to. But then Ireland itself examine other sides closely and look for their weaknesses and have the players to expose weaknesses that are identified. England scored two tries at home against a Welsh side with the ability to make you suffer on the counter and in finding those gaps you didn't think you had. Wales are also a side that are no slackers in defending. Ireland scored five tries at home against the same side. And it wasn't just hoosh, hoosh, bang, bang stuff either, but some fast intelligent play that kept Wales under pressure down their own end when I'm not sure they expected to be for so much of the game. So it's percentages. What do you ask your players to concentrate on and where might you be exposed by doing so - BUT do you back your plan to still have enough to win, even with certain weaknesses? Nothing is perfect but that's why we love rugby. A revised Scotland squad is being announced this morning. 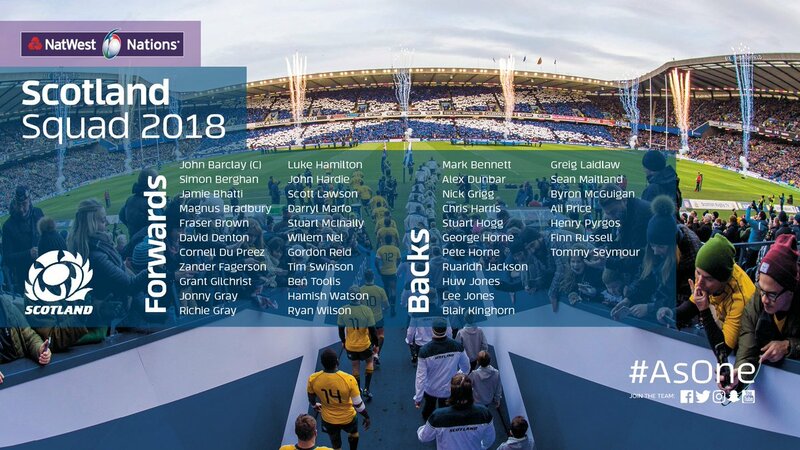 RDW_Scotland wrote: A revised Scotland squad is being announced this morning. Presumably Richie Gray will be added - he seems to have come through Toulouse's win against Bordeaux unscathed. And the Calvary in the forwards and centres! If Dunbar is fit will he come on to the bench? Toonie enlarges the squad and brings in some of the walking wounded, along with George Horne, who pretty much everyone would agree deserves a call up and John Hardy, who could prove to be a very useful bench addition for the Ireland game. There are no club games next weekend, which means he won't be robbing them of players by bringing in a bigger group and it gives him the chance to see how a few of them, particularly Gray R, Dunbar and Marfo have recovered. Marfo has not played for ages, so hard to see him being match fit. Ritchie got a full game in this weekend, so is got to be in contention for a bench slot. Dunbar more of a risk, Horne has been playing well and seems to compliment Russell and I am not so sure he is as good an impact player off the bench as Bennett or Grigg would be. If Fraser Brown is fit then surely he goes straight onto the bench as well, Lawson has not been used the past two games and is only there to cover injuries. Good to have options though and we are not far off having our full squad fit and ready to fly. Good news to see so many players return, although the only ones likely to make an appearance on Saturday are Brown and Gray. It is good to have a larger squad together though with a view towards the summer tour and beyond. With few club games at the weekend and none this weekend it is a chance for the full squad to get a good workout at training and give us the best possible preparation for the Ireland game. BigGee wrote: Toonie enlarges the squad and brings in some of the walking wounded, along with George Horne, who pretty much everyone would agree deserves a call up and John Hardy, who could prove to be a very useful bench addition for the Ireland game. I think Richie would be our biggest boon to be honest, as much as I like Swinson, he's a bit lightweight going forward, though he does offer good blindside cover and doesn't let you down. Fair point RE Dunbar - I'd be very surprised if Grigg got dropped, it'd seem unfair after a decent showing for 15 mins against England. Though I guess it depends on how they go in training. Fraser Brown would be good on bench but I think only if he's going well in training. Lawson may have been disproportionately guilty of that one loss in the past but arguably Brown has down the same against England (well it didn't help certainly), and both are fairly solid in the set piece. So I wouldn't be disappointed to see Lawson on the bench still seeing as Brown hasn't had much of a run out, though presumably has still been doing non-contact training. Horney will get his chance against Italy - I can't see Toonie giving up Price's bench slot - though maybe he's been brought in to give Price a kick up the backside as his performances have felt a bit flat recently as I think his confidence took a big knock against Wales. If Seymour is not fit and he must be a big doubt, then I would start Kinghorn. Ireland look a bit vulnerable to pace out wide and BK certainly has that. having two guys (Hoggy and BK) who will run it straight back at you and Maitland who is hardly a slouch either, will make Ireland think about their kicking a lot and that is a big part of their game. I assume given Seymour hasn't been released through injury, it suggests it possibly wasn't as bad as it first looked. I'd be interested to see how Kinghorn got on, on the wing against Ireland. They seem to have a narrow defence (based upon their chat here) so with Kinghorn's ability to find a gap and pace, it could be interesting. Probably not the right time though. Before the tournament started i would have said the Ireland will win comfortably. But after Scotland beat England, well i am not so sure any more. If Scotland can reproduce the form that they showed against England. Ireland might be in for a shock to be honest....That is a big IF. though. But you never know in this game, predicting the out come of a game as become alot harder these days. I reckon Ireland will win. Still have not lost at home in the six nations under Schmidt. Scotland brought some clever tactics against Ireland last year, some beautiful Hogg tries and Edinburgh traffic all conspired to give Scotland a deserved win. This will be a much bigger challenge for Scotland though so I think they will probably come up just short. Hopefully anyway. Hmm definitely less confident now since Farrell's injury. The options now are not good -Ringrose is not fit, so we are looking at Arnold or Marshall as next choice 13. I heard Carbury was training at 12 alongside Aki, whcih would be a big risk. Earls at 13 didn't work well against Italy, so wouldn't be keen on that either. Despite our increased depth this is a real problem, especially with Scotland and England so dangerous in the wide channels. majesticimperialman wrote: Before the tournament started i would have said the Ireland will win comfortably. Oh these remaining games are much harder to predict for sure (they haven't been easy all through to be honest). There are a new set of conditions around the big ones now. The finishing line is in sight. Players might be forgiven for glancing ahead now and it might prove costly. Whatever England might say, France are finding something more consistent, and though they lost away to Scotland and just were pipped at the very end by Ireland, talk of this being a worthless French side in some 606 comments over the weeks is not accurate. Jones won't know what to expect, either from France or his own team. Ireland are........................ favourites.............. with still the biggest prize available to them. But those two things might grow a lot of pressure on players and coaches. You have to put up or shut up on these occasions and Scotland and England will put the serious questions to us. Will Irelaqnd's players be able to fight hard enough in the two remaining games? If they try to leave something in the tank for England, Scotland might kill them. Scotland too though, don't get off the hook. They have to find their own feet and prove to themselves that the drop off against Wales was the blip and not the win against England. So they'll be nervous to prove to themselves (again) that they are as good as they sometimes look. Will they rush the fireworks too much and get caught out like against Wales? Or will they rush the fireworks and kill us off in the first half? Rushing the fireworks is the only game Scotland trust. The dice is rolling to see where it gets them this time. So the pressure grows - on Ireland, England and Scotland.... and France. France have their own ambitions and they'll want to prove that they are heading back into WC contenders territory. They're never far away from it and they have a tight deadline now to get there. rodders wrote: Hmm definitely less confident now since Farrell's injury. Id start Ringrose. Take him off for Carbery on 60 if he is running out of gas and put Sexton in 2nd centre. Chris Farrell is a big loss though, you are right. Ireland have been made to look good, fingers crossed the Scottish team that played England turn up. TightHEAD wrote: Ireland have been made to look good, fingers crossed the Scottish team that played England turn up. France did a great job of making us look bad. Damn French. Well, what I'm trying to say is that Ireland will compete there with their Scottish pals. So we both may get pinged off the field by a ref that likes the Breakdown to be more English than Pro14 but the Irish boys will be getting in there heavy-duty anyway. If Ringrose is fit then he should play at 13, if not then too big of a risk for me. Marshall would be my choice. In fairness, I would have Marshall at 12 and Scannell at 13. Earls at 13 should only be used in sheer desperation, he is far more potent on the wing. Carbery training at 12? Is Schmidt trying to develop his own Paddy Wallace? I heard Scannell is not available this week either, is that right? Given that Schmidt hasn't called up an additional centre I presume he is going with Carbury or Earls in midfield? rodders wrote: I heard Scannell is not available this week either, is that right? McFadden is also an option at centre. It would be worth it for all the whinging alone. Not heard anything about Scannell, thought he was back. Carbury seems too lightweight for 12 for me, keep him as back up 10/15 for me. Earls, as I said, is much better on the wing than at 13 but he would not let anyone down at 13. Holey jeepers he's going to start Earls at 13 and bring McFadden in on the wing. It's a parting shot at all the whingers by Joe to throw the championship before announcing he's joining Gibbes at Waikato! I'd be delighted with that! Ireland are coming up against the most ruthless attacker at 13 in the world right now (Huw Jones) and are playing someone unfamiliar with the defensive channel at 13? Does that strike anyone else as particularly suicidal or just me? Maybe not suicidal but certianly a bit odd. Earls will give his all but given how he and Stockdale have had great tournys on the wing, it seems a bit odd to put Earls at 13. I'm not sure the Irish wings will be seeing as much ball now! I'm sure Ringrose will start. He will definitely have his hands full with Jones and Russell's wonder balls. As if it wasn't hard enough to deal with Stuart Hogg. IMO Hogg by the way is the best attacking back in the world IMO along with Folau and Ioane. Collapse2005 wrote: I'm sure Ringrose will start. He will definitely have his hands full with Jones and Russell's wonder balls. Sorry but I laughed at that. I am too old to be finding that funny. Yeah its meant to be lighthearted however, one of Russell's passes last Saturday was probably the best pass I've ever seen in an international. This guy is special. He should definitely have been brought on the Lions tour. Where did you see that, the most recent reports I saw Ringrose wasn't even in the training squad? bbc wrote: Ireland are without injured centres Robbie Henshaw and Chris Farrell for Scotland's Aviva Stadium visit, with fit-again Garry Ringrose the front-runner to start at outside centre. If Ringrose is properly fit, Ireland will probably be fine in the centres. Heck if L Marshall is put in there, he will do a great job or even McCloskey at 12 and Aki at 13 would be fine. I rate the Ulster centres highly. The worst case for Ireland is putting Ringrose to start with Carbery or Earls as cover and for Ringrose to last 5-10 minutes. If I were Schmidt (I am not), I would probably go L Marshall who is a solid defender to go up against Jones and is not a bad attacker in his own right. Also covers 12 if I remember correctly should it be needed. Luke Marshall was superb against Edinburgh a few weeks ago - he looked like a player desperate to get his Ireland place back. Apparently Tim Visser is not in the squad because he injured his head playing for Harleyqueens at the weekend. How many times have we begged him to be careful and not throw himself recklessly into tackles? The man has no sense of self-preservation. jimbopip wrote: Apparently Tim Visser is not in the squad because he injured his head playing for Harleyqueens at the weekend. Switching Aki to 13 would be an interesting twist and using a second five-eighth with Carbery going to 12.